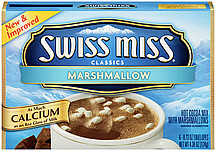 10 envelope box of Swiss Miss Hot Cocoa Mix with Marshmallows. Sugar, *Corn Syrup, Modified Whey, Cocoa 9Processed with Alkali)Hydrogenated Coconut Oil, Marshmallows (Sugar, *Corn Syrup, *Modified Corn Starch, Gelatin, Artificial Flavour)Less than 2% of: Nonfat Dry Milk, Salt, Dipotassium Phosphate, Carrageenan, Arti*Produced from genetically modified maize. **May have an adverse effect on activity & attention in children.